They are meant to commemorate great achievements or heavy sacrifice, not shows of force with machine guns, armored vehicles or jets. I am glad that President Donald Trump’s plan for a grand military parade never made it past the proving grounds. The idea was a bad one on many fronts — a waste of resources and misuse of our service members’ precious time, to name a few. More than anything, the type of flashy spectacle that Trump envisioned is fundamentally at odds with the dignity of our great military. I enlisted a year after 9/11. The terrorist attacks on our country made me realize that the world was not as safe and peaceful as I had assumed. Like many Americans, that tragedy left me with a strong desire to take action — to do something about it. After 13 grueling weeks of training under the endless California sun, my comrades and I took one step closer to making a difference: We were United States Marines. My graduation from boot camp culminated with a parade. We practiced countless hours for that parade. Day and night, we’d form up on the hot asphalt parade deck of Marine Corps Recruit Depot, San Diego, marching from end to end in near-perfect rank and file. The parade was not for us: It was for our family and friends to see what we had accomplished and whom we had become. On graduation day, our loved ones sat proudly in metal bleachers cheering us on as we stepped confidently into the future of service to our country. More than a few of the men that I marched with that day are no longer with us; casualties of the conflicts that lurked ahead. I will always remember my graduation parade fondly, but the finest military parade I ever experienced is the one conducted each Friday over the summer by the men and women of Marine Corps Barracks, Washington, D.C. (8th & I). The Evening Parade, as it is known, features the absolute finest that the Marine Corps, and our country, has to offer. I first saw the parade in 2011 as a newly commissioned lieutenant. It had been almost a decade since my enlistment, and I had personally experienced much of what it meant to serve in the military during that time: multiple deployments to Iraq, long periods away from home and growing public dissatisfaction with the wars. But as I watched the parade, I was reminded of how lucky I was to serve. Set in the shadows of the brick barracks and maple trees of the “Oldest Post of the Corps,” the parade begins just before sunset with a concert by the Marine Band. The band, dressed in bright red jackets, wield their instruments with a drill instructor’s precision, their music piercing the night air like a cannonade. The band is joined in formation by the Marine Drum and Bugle Corps, Color Guard and Silent Drill Platoon, each marching with graceful purpose across the fading light of the grassy parade deck. I watched with rapt attention, equal parts awe and pride. The Silent Drill Platoon is particularly spellbinding. Clad in the Corps’ iconic dress blue uniform and shouldering wooden M-1 Garand rifles, this 24-member unit makes you believe that they share a single heartbeat. They strike their rifles in unison like a snare-drum, twirling them into the air like batons, daring the audience to think one might drop only to make a perfect catch, time, after time, after time. Their performance brings to life that abstract feeling so many of us express about our decision to serve in the military: That we wanted to be part of something much greater than ourselves. It is totally dark as the parade concludes. The ranks of Marines exit in lock-step review, the stars and stripes retired as a single bugler remains, silhouetted by a spotlight, to call Taps. Seeing this, I experience something probably akin to what my parents felt as they watched their 18-year-old son, transformed before their eyes, marching for the first time in the uniform of his country. Military parades shouldn’t be held on a whim. They are meant to commemorate great achievements or heavy sacrifice. 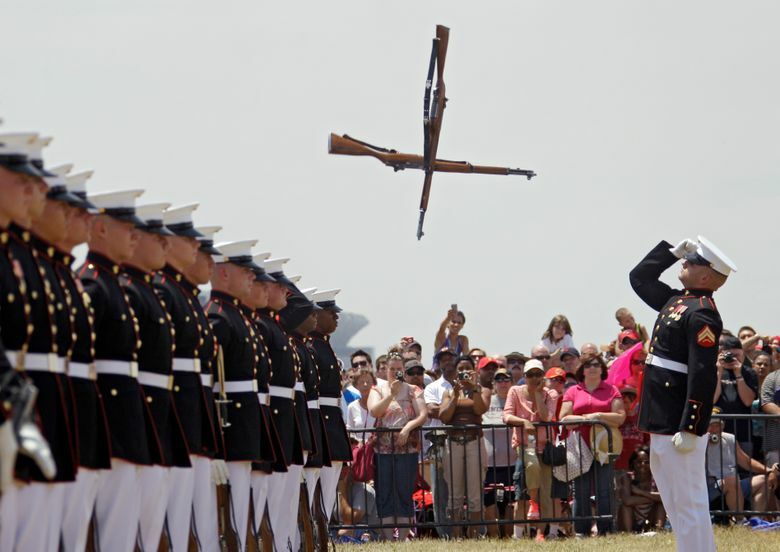 In describing the Evening Parade, the Marine Corps’ website notes that the performance is “without fancy theatrics” and “offered solely to express the dignity and pride that represents more than two centuries of heritage for all Americans.” You will find no machine guns, armored vehicles or jets at the Evening Parade. Yet that is exactly what the president had hoped for — an ostentatious display of chest-pounding that is all too characteristic of that man but completely out of character for our armed forces. I hope that the president’s grandiose vision, like so many of his fleeting ideas, has actually perished, never to be heard of again. America doesn’t need a grand military parade; we already have them. Ben Nelson is an attorney in Seattle. After serving in the Marine Corps for 12 years, he resigned his commission following the 2016 election.